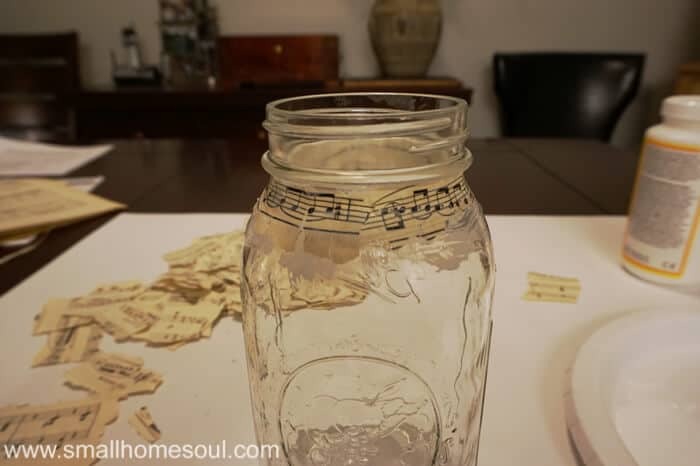 Easy DIY Sheet Music Mason Jar Vases - Girl, Just DIY! For this month’s Thrift Store Challenge I decided to use some old sheet music I found at hmm, where was it? Oh yes, a thrift store 🙂 I’ve seen so many projects recently using sheet music so I’d been on the lookout for some. I knew I wanted to combine it with one of my favorite things, mason jars!!! 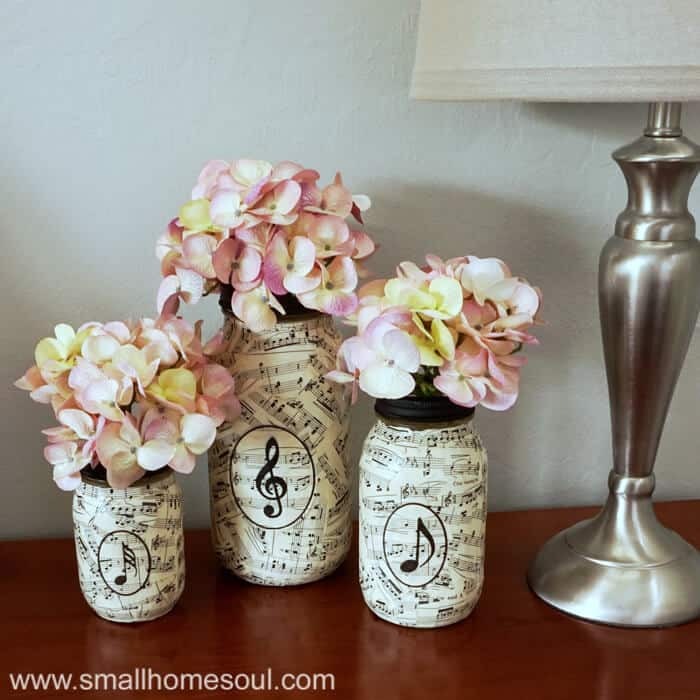 So I got busy this weekend (yep, procrastinated again) and created Sheet Music Mason Jar Vases. Don’t forget to visit my Thrifting friends and co-hosts who are linked up at the bottom. Many months ago I found a stack of old sheet music at the Teen Challenge Thrift Store. I like shopping there when I can because they’re a Christ-Centered treatment program to help people get clean and sober. They staff the stores with program graduates and all proceeds go to support the Teen & Adult treatment facilities. That day I bought a bunch of stuff for around $20 (their prices are low too-bonus!!). Oh, that might be where I picked up the Brass Platter that mysteriously appeared in the garage 🙂 Anywho let me show you how easy and fun this project is. 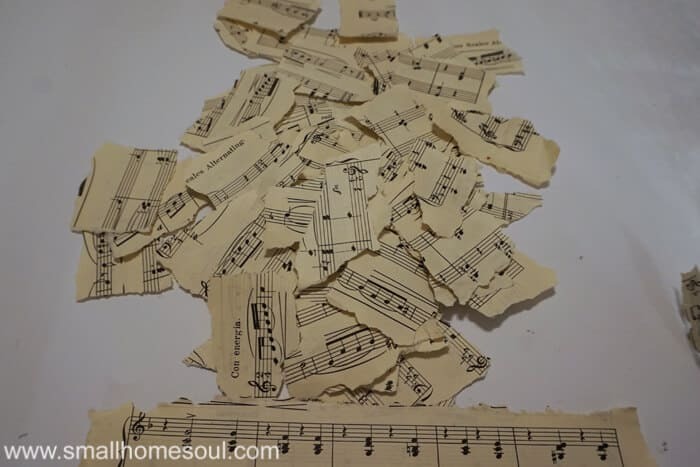 Start by tear your sheet music into 2″ pieces. Any shape is fine. I tore up 3-4 pages for 3 vases. Tear one more straight long piece for the neck 3/4″ tall by the circumference of the jar. I didn’t use scissors for the upper edge but you could. Tear along the length of the paper about half way up. This will help it wrap around the jar without buckling. Brush a thin layer of mod podge around the neck, enough so all the paper touches the mod podge. Apply and adjust the sheet music until it’s snug at the rim. 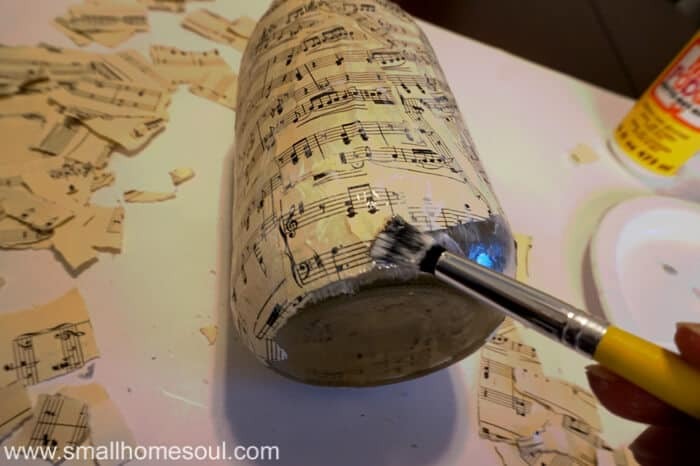 Brush more mod podge on top of the sheet music. Now start applying your pieces in the same manner as above overlapping the edges to cover the glass. Use your fingers to press out any excess glue near the ridges in the glass before you layer your next piece. When you get to the bottom edge use the same tearing method as the neck but this time use the regular size pieces as shown below. 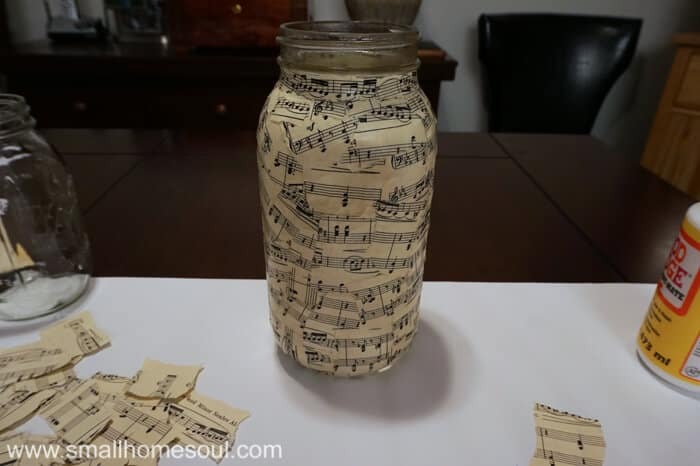 Wrap your sheet music pieces onto the bottom edge of the jar slightly. When the jar’s covered press down any edges that are sticking up. Give it one all over coat of mod podge and set it aside to dry. While the vases are drying paint the metal rings of the jar lids with a few coats of black Chalkboard Paint and let them dry. 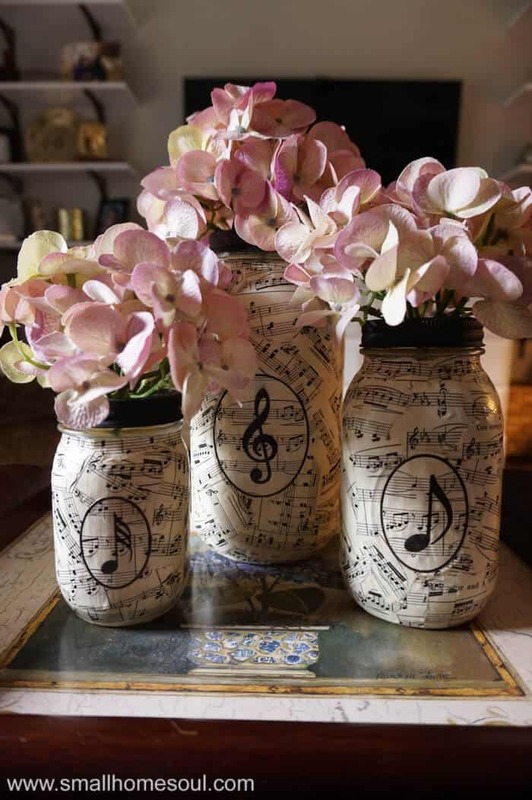 To really make the jars look beautiful give them a little something extra and add some labels with musical notes. I made mine using Word to fit inside the raised oval area on the jars. If your small mason jar doesn’t have a raised oval (mine didn’t) do a little math, and trial and error, to find the right size to scale. Print off a few samples on white paper to find the size for each jar that you’re happy with. Then feed a page of sheet music into the printer to get the perfect labels. Lastly cut out the circles and mod podge them onto the vases. 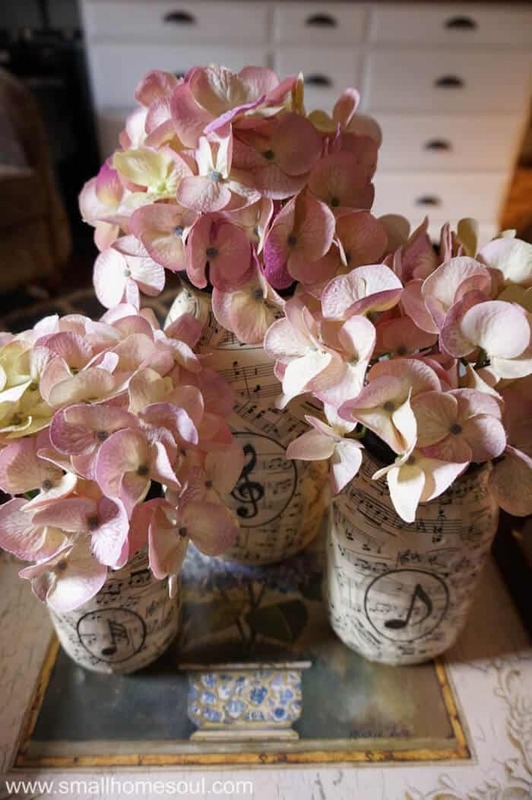 If you plan to use your sheet music mason jar vases for fresh flowers you’ll want to protect it. Give them a spray coat of the Polycrylic to protect them from water drips on the outside of the vase. That’s it, Simple Simon right? 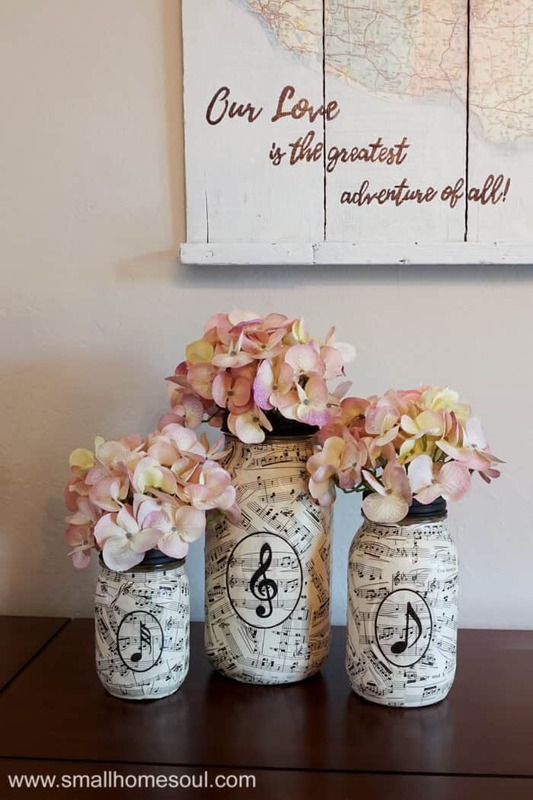 And now you have three beautiful Sheet Music Mason Jars to display your favorite fresh or faux flowers. 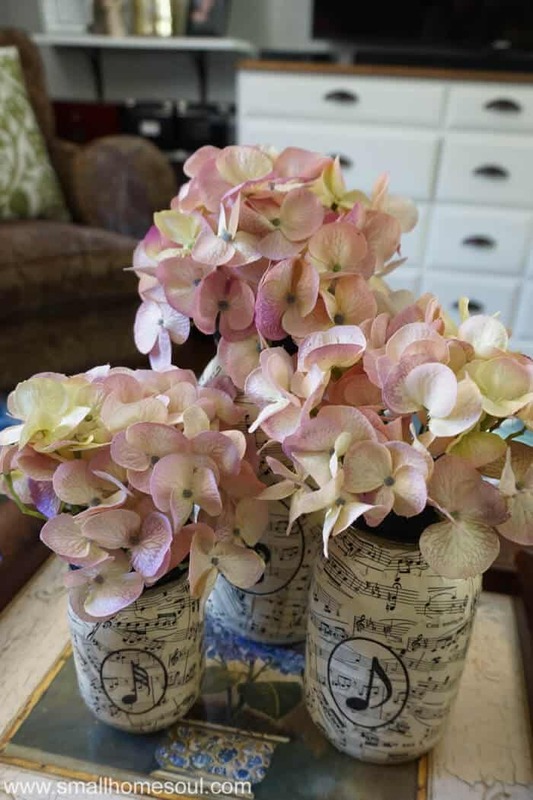 Aren’t these faux hydrangea blossoms beautiful, and so realistic looking too? You can see how I used more of them in my tutorial for making a DIY Hydrangea Wreath. I can’t wait for you to see what everyone else created! Outstanding. I love these! They are so original and totally charming. 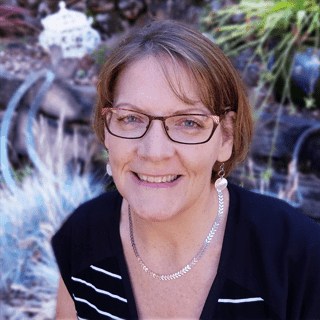 Toni, this is a really cute project! This would be great as a music teacher gift! So adorable Toni!!! Such a simple and cute project!!! What a great idea. I love anything with sheet music. What a cute idea! I love this. I have a ton of old sheet music that I use for crafts and scrapbooking. Thanks so much Chelsea, I have a ton left so I’m trying to find some other projects to use it for. These are so pretty! Love the sheet music! Ooooooh, I love this! It would make such a great gift idea for a musician! Thank you Chelc, you are so right a musician will love them! Thanks Chelc, yes I bet all musicians would appreciate these. These are really pretty! 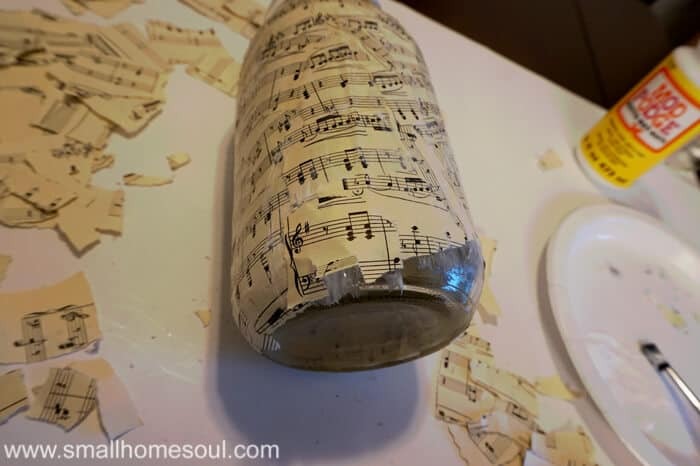 It was a great idea to tear up the sheet music rather than wrapping the jar with a whole sheet! It really adds to the interest of the piece. Thanks Jeannee, I like the randomness that it adds. What an adorable jar makeover. Love the big note labels too. I’m so glad you you like them Kim! They needed an extra punch and the labels work perfectly. Oh my gosh. These are so precious and looks gorgeous with the pink hydrangeas. LOVE this project. What a fun project. They turned out beautiful! Thank you Dru, I’m really happy with them. Fun idea! I wouldn’t have thought to decoupage mason jars. Thanks Amanda, I hadn’t decoupaged any jars or bottles since I was a little kid. I love it, so many design directions you could go. Just lovely. I especially like the black rim at the top too. These would be pretty incorporated into Christmas decor also. Thanks Shirley, I think it needed some additional black to balance it. Yes, It would be easy to use any flowers for any season to change the look completely. This is beautiful Toni! I brought home some old song books that I found in an old building and I can’t figure out what to do with them. I would not have thought to use mason jars but they look gorgeous! Great job as always. Thank you Sherry, you are so kind. There are so many great options for using sheet music or old books. 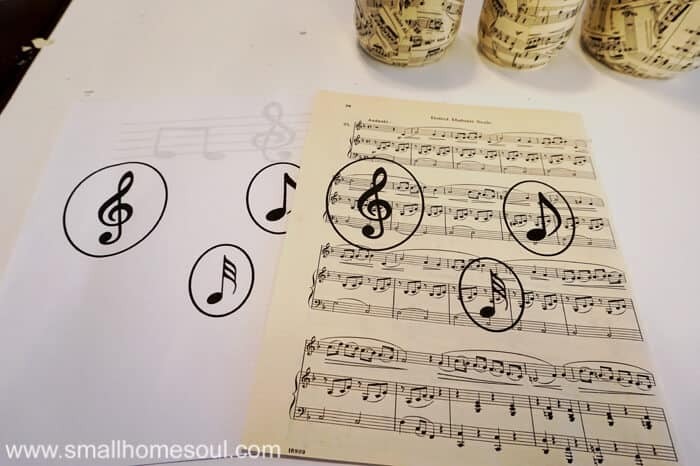 Using music sheets for decoupage is a smart idea! This would be perfect for my mother-in-law, who is a former piano teacher. I’ll have to keep this in mind come Mother’s Day. Visiting from Thrift Store Challenge. I bet she would love them Victoria, perfect for music teachers for sure! These look really sweet, great gift idea for a musician. Thank you Claire, you’re so right. My mom used to play the piano, maybe a good mother’s day gift for her like Victoria mentioned.